Folk metal and myself have something of a love/hate relationship. 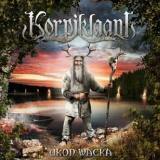 As much as I love the wonderful songwriting of Skyclad and the stunning melodies of Arkona, I do tend to cast something of a leery eye at bands like Korpiklaani that seemingly exist only as quirky party music. I own several of the Finnish humppa crew’s albums and can’t tell them apart – reading back over past reviews of the band on the site, I see that I commented once in a thread calling them ‘campside partytime drinkbeer happyfriends folkmusic’ but criticised them for their sameyness, and really there’s not much more that needs to be said. The idea of this band, a fun wacky party group, is much more enjoyable than the music they make; let’s face it, we all know what humppa sounds like and can play it in our head. Why buy an album when you can just do that? Having said all that, I must admit that Ukon Wacka caught me a little off guard. Volunteering myself to review it in the absence of interest elsewhere on the team, I expected to fill this review full of complaints about how it’s the same as their last album but instead found myself considerably cheered up by this album, at a slightly stressful time in my life. It’s undeniably happy music, seemingly designed to put a smile on your face, and the clap-along opener Louhen Yhdeksäs Poika wastes no time in doing just that. The following Päät Pois Tai Hirteen takes a slightly lighter, hard rocking approach as the accordion comes to the fore and the song’s infectious chorus lodges itself firmly in your head. Call them all the names that you like, but there are a bunch of talented musicians in this band and that they can still write catchy songs seven albums down the line is impressive. Standout moments come thick and fast – I liked the slightly ominous feel that Lonkkaluut took on at one moment with an effective vocal line, suddenly shifting to screams and screeching violin towards the end in a real change of atmosphere. Tequila’s bizarre South American feel is a wonderful moment that had me laughing out loud in delight, something I can rarely say about metal these days, and Koivu Ja Tähti’s understated epic vibe worked well. Instrumental Vaarinpolkka, meanwhile, is a nice little break before album finale Surma slowly wades in with flute, getting heavier, launching into speed, and proving itself an excellent song to end on. Sure, not all is brilliant – I wasn’t quite so fond of the slower-paced title track for one, despite the nice shift in singing style by frontman Jonne to a low, throaty gasp, and the almost power metal feel to the riffing. There’s a bonus track floating around on certain versions, a cover of Motorhead’s Iron Fist, which has been part of the band’s live show for a while and sounds fun from a bit of YouTube research. How much you enjoy this album will ultimately depend on your mood as much as your past experience of the band – I’d certainly recommend that those who have grown bored of the band give this a try in the hope of it earning them a smile. Of course, this is highly recommended if you love Korpiklaani to bits; it’s ensured that I get those aforementioned albums out from wherever they’re buried next time I’m feeling low.